Copyright (C) 2013 Great World Games, Inc. 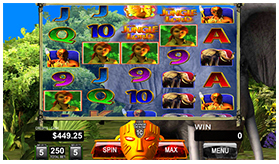 The Jungle Lord Tanzania Slot Machine" is a classic Jungle themed video slot game featuring bet-able reels that offer 243 ways to pay in normal mode and 3125 ways to pay in expanded base feature mode. 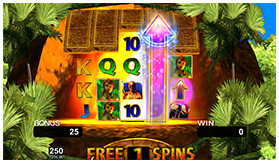 Each reel allows a maximum reel bet of 5 credits. 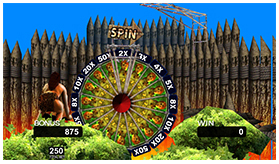 The largest bet is 250 credits with a maximum win of over 900,000 credits. The base game features stacked character symbols (Jungle Lord and Jane) when expanded multiply the pays normal pay by an additional 2X. 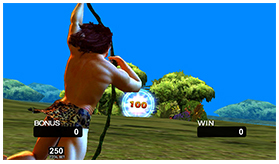 The Jungle Lord Swing Wild feature places additional wilds into the base game. Other base game features include jungle events that rock the wheels and change shape to 5x5 for increased action! 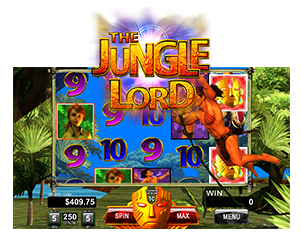 "Jungle Lord Tanzania" features multiple bonus games: Fire god volcano free spins, the fire wheel, Golden Mask Powerups, and more! Help rescue Jane from the fire god!